The Swannanoa River is one of the most precious resources in our beautiful valley. It flows gently, with intermittent rapids, toward the French Broad River. 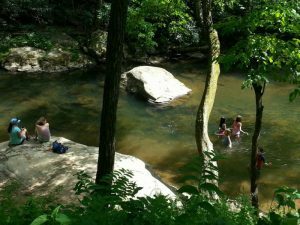 You might see a fisherman casting a line, young people swimming, a child wading along the shore, boys skipping stones, or families picnicking along the banks. Geese, heron and ducks are frequent welcome visitors. But unfortunately, the river sees some unwelcome visitors, too. Trash and debris washes downstream, collecting along the banks and river bottom, damaging water quality and marring the beauty of the river. After heavy rains and high water this past year, the river is in dire need of a cleanup. Join your neighbors on Saturday, July 9, to help rid the river of unsightly trash! The river cleanup is sponsored by Friends and Neighbors of Swannanoa (FANS), in partnership with Asheville GreenWorks, and will take place from 10:00 a.m. – 3:00 p.m. This year, many young volunteers from the summer camp at Ridgecrest will join the community cleanup effort. Volunteers will use canoes (provided by Asheville GreenWorks) to collect debris as they wade through the river and walk along its banks. If past Swannanoa River cleanups are any indication, the volunteers will have loads of fun while collecting loads of trash!